Found everywhere in South Africa, except in the most northern coastal area ofthe Atlantic Ocean (in the North Cape Province) and in some part of Garden route, which covers a fair amount of the coastal area where the Western and Eastern Cape Provinces meet. The Aardwolf shouldn't be considered as a carnivore in any strict sense: it actually feeds on millions of termites or harvesters. It's size and name have made many farmers decide that his diet could include sheep and goats, which have proved to be an unfair expectation. 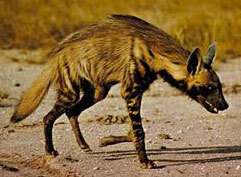 The Aardwolf's dental framework isn't the typical strong arrangement of the meat-eating family. At night the would come out of their underground hideouts, and wander about in a small group (or sometimes alone). They would somewhat clumsy - steer away from trouble and confrontations with other fighting animals, but if confronted, their defense would, if the dodging runaway plan didn't work, first consist of a raising of its back manes, growl and bark fearsome as if it is much more dangerous than it really is. And if that doesn't do the trick, secreting a strong musk-like scent will be the next move, which can makes their enemies hesitate and gives the Aardwolf the necessary time to make it to the nearest bunker down under.